Live footage showed the men being shaken violently by the vibrating rocket as it broke down while flying. Then, the rocket’s emergency escape system was triggered and the crew capsule detached from the rest of the spacecraft. It landed hundreds of kilometres north-east of the Baikanour launch site, sparking a major rescue mission. Both men were unharmed. Mr Ovchinin, 47, told reporters before the latest launch that the rocket was now in good shape, although a small fault had been discovered during its final checks on Tuesday. As a result, some components had needed to be replaced. “There are no problems,” he told reporters. 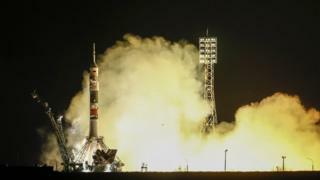 Mr Hague, 43, added that he was “100% confident in the rocket and the spaceship”. Another Soyuz rocket successfully launched and docked on the ISS in December, the first crewed launch since the failed mission.